Being a politically aware person all round, and a great fan (at least in theory) of telling off people who have done something wrong, not to mention feeling terribly betrayed by the LibDems despite my lack of voting power in Britain (they seemed like the sensible people, dammit; and now they are all skulking around doing dodgy things with dodgy people -- it is not right) I naturally joined the local protest against cuts in education funding in Britain. It helped that I am very much opposed to the idea that education should be something you have to pay for in principle. I joined up with some people from the department (although I must say there was a shocking lack of lecturers, and I only saw one of my students) and headed over to Bristo Square (which is just off George Square) to be shouted at through a megaphone. I must say, the megaphone-shouting of the day was very disappointing. I don't think I heard more than two sentences together throughout the day. 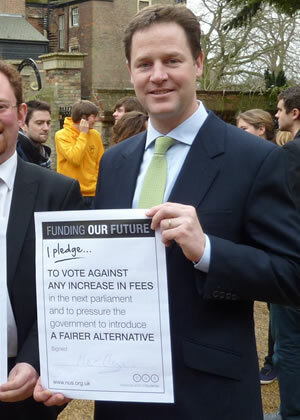 And it is signed by Nick Clegg, the deceptively friendly-looking man holding it. Looking rather worried he also added, ” We quite honestly would have sold Vince Cable’s arse on Clapham Common if it meant I could get my foot across the Downing Street threshold.” Mr Clegg confirmed whilst taking a quick drag on his cigarette before setting alight to other election pledges in his office dustbin. They did not seem quite as cheery, and they did seem quite reluctant to let us anywhere near the letterbox. And so the study-in began. It was like a sit-in, but with books. And outside. They kept interrupting it with appeals that we couldn't hear because lecturers insisted on confirming their notorious ineptitude in all things technical by speaking softly into megaphones while holding them like michrophones. But what mattered was the principle of the thing. Once the people trying to talk at us stopped doing that, however, I had thought we would settle in for a proper evening of study-ining. I had only had time for a fleeting thought in the direction of how I should have brought a thermos with some tea, however, when everyone suddenly got on their feet again. There was then some commotion as the pledge copies were handed over and two representatives were allowed to put them through the letterbox to great cheers. 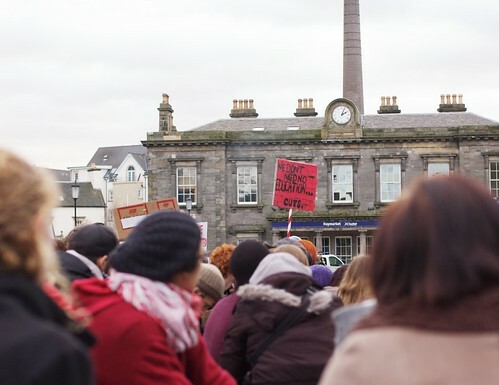 And then the whole demonstration moved back towards Bristo Square. I was a little surprised, because there had been talk about sitting there "all day" and we had hardly had time to even open our books without some interruption or other. But I assumed everyone was feeling the cold. At the very first intersection, however, everyone sat down again. Now, at this point I started thinking thoughts. students, workers, unite and fight. It annoyed me a little that instead of making a point outside the LibDem offices, we were suddenly (as one of my co-students put it) reclaiming the streets. By sitting down at every intersection. And with the increasing aggression around me joining up with my slight annoyance, I decided that sitting down at every intersection between Haymarket and Bristo Square was not worth the potential of getting caught up in a hijacked demonstration like the one in London. If we were going to be sitting down in the street, the sensible thing to do would seem to be to do that where we could make a clear point. I don't know why we didn't. 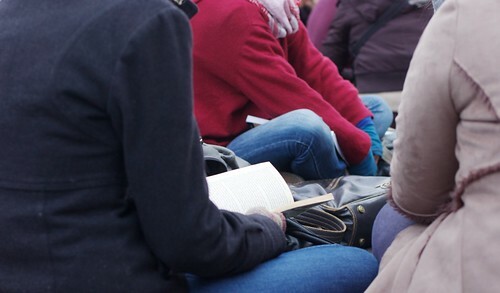 Whether it was because someone felt a bunch of people studying in the streets was not aggressive enough, or whether the organisers simply got cold and felt they had to walk a little in between. At any rate, I went home after Tollcross. Nick Clegg said in the Hugo Young speech yesterday that he hoped people would read the Education White Paper published today before taking to the streets. As I have been travelling today, and thus unable to shout at politicians or set fire to police cars, I thought I should do as he asked, and read this document to see what they are really saying. However, this turns out to be easier said than done. Half an hour of googling and searching government webpages has so far failed to give results, though I guess the crappiness of mobile internet should take some of the blame. I'll give it another try when I get home, unless anyone would care to provide me with a link. I read the full text of your recent Hugo Young Lecture, and I particularly agreed with the bit where you encourage people to "examine [your] proposals before taking to the streets." I feel it is an important principle that if one is to go out and set fire to police cars, one should at least know why. Personally, I am Norwegian and would thus have to pay ridiculous fees to study in Britain regardless of your current proposals, which means that I don't care enough to set fire to cars over this issue, but I still thought it would be interesting to read what you are actually proposing. To my great surprise, however, this turns out to be impossible. I have found many newspaper articles who refer to the education white paper published yesterday, but not one of them includes a link to the actual paper. I have also looked at the Government's web pages at direct.gov.uk (the design and userfriendliness of which is, by the way, another thing I would like to talk to you about, but I will leave that for later), but I still couldn't find the original document. For the future, I would suggest making documents such as these available to the general public. You would probably still see some burning of cars, as, lets face it, some people just feel arson is more fun than reading government documents, but you could at least claim to have done your part. Studentene ved Edinburgh har bestemt seg for å okkupere George Squares styggeste bygning (hvorvidt valget falt på den på grunn av estetiske hensyn vites ikke). Her er bloggen de har lansert i den forbindelse. This afternoon the Occupation was stormed by large numbers of police, who used a battering ram to demolish an inner wall of the library. The atmosphere remained defiant throughout as hastily constructed barricades were cast aside by the full force of Thames Valley Police. Occupiers were forcibly removed one by one and subjected to a full body search. Our demands remain the same. 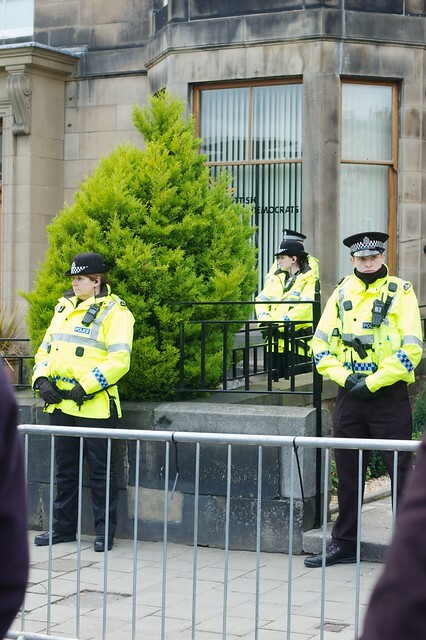 The University have colaborated with the police to ensure the provision of public education has been denied. We are chilling, recovering, planning. Also, interesting stuff seems to be happening in Edinburgh, this afternoon, according to their blog. I feel a bit silly for being in Norway at the time. Are you sure that's the one? I also found that one, but it seems to be about schools, not higher education. Politicians are always going on about getting young people interested in politics: well, that's one thing this government has achieved. Perhaps Nick Clegg can turn that into a boast. Thank you, I'm glad I have nothing to do with British education. It looks, at least from the foreword, that this really is the paper you are looking for, Tor. all children, whatever their background. Interesting enough, it's always some other country that gets the description «most successful». It's the political equivalent to Doom's iddqd, or to warmongering's «Those guys just called you a bunch of fags». I also find it amusing that they leave it to each separate school to fail at succeeding, but the credit for success, benificial as it is, will naturally fall to the politicians who issued this White Paper, if there'll ever be any. But the reason people are trying to set fire to police cars, spraying graffiti in the Offices of the Conservatives and occupying lecture theatres is that the government wants to increase university fees, and the Schools White Paper doesn't talk about that at all, so it wouldn't make sense for Nick Clegg to ask people to read it before taking to the streets over fees. Politicians will at times say things that make no sense. Or refer to sources slightly or completely unrelated to the subject at hand. The reasons could be many (obscuring, deflecting from or even silencing the debate), and I don't know if that's what has happened here. But I know it wouldn't be the first time. Maybe he's just confident that no-one burning cars and spraying graffiti will read that specific paper. And that is also why he tries to reason with the same people by inciting them to actually «RAFO». Only, when you read, you won't find out, but then again the protesters won't find out at all, because they are not the sort of people to waste time reading oblique political papers. I mean, come on. How many times haven't successful politicians tried to defend an argument (which reveals itself to be invalid or completely bonkers), only to suddenly change the topic to something true, but nonetheless irrelevant, when they've been found out.